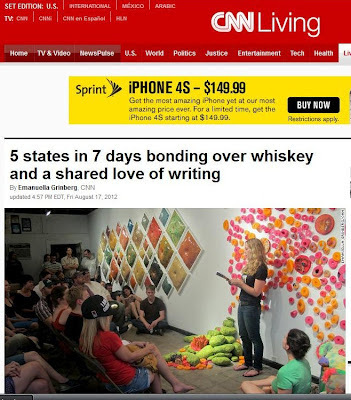 In a great article over at CNN about the Southern Summer Comfort Book Tour that featured the likes of Chloe Caldwell, Mary Miller, Elizabeth Ellen, Brandi Wells, and Donora Hillard, there's some sweet name-dropping, too. Vouched Books & The Lit Pub & Safety Third Enterprises get a hey now! as well as Amy McDaniel, Laura Straub, Heather Christle, Scott McClanahan, and me (!). Yay! Great to see the indie lit world getting such great coverage. Check out the article HERE. And notice the handsome man in the upper left corner of the picture. That's right, it's my publisher Mr. Matt DeBenedictis, writer & mastermind. Awesome, congrats! I love your new website too. You go! Thanks, Ethel. Still going. Not sure how sometimes. You go too! Haha! Whooo!